14 SAC meeting 3:30 p.m.
16 Dep. Kowieski Cyber/text safety pres. 7:00 p.m. Please check out the amazing discounts and benefits offered to our PTO members by our JCE PTO Business Partners. The St. Johns County School District Provisional Transportation Waiver Program (PTWP) extends transportation services to students assigned to district schools based on space availability and criteria. If a student’s lunch account balance is below $0 they are only allowed to purchase a lunch with no extras. If you would like to keep track of your student’s account please sign into paypams.com. If you would like to place a restriction on your student’s account you may send in a note to your student’s teacher, or email the cafeteria manager at [email protected]. For online access to a student’s grades, parents need to complete the form and return it to our front office staff. Once returned, access information will be given to your child within three school days. Learn more about eSchoolPlus and Home Access Center (HAC). Here is the link for the Student Info Update Form. You can also check the district site for more information. Mrs. Karl is available here at JCE to help answer any questions. Extended day is accepting applications for the 2018-2019 school year. Contact the Extended Day Coordinator, Jennifer Frascello, 547-7983 or [email protected]. 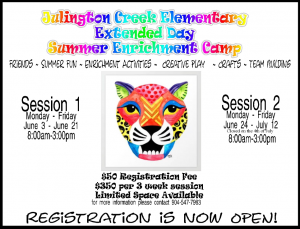 Visit the Extended Day page for more information. Please be prepared to show a picture ID when coming on school grounds. All visitors to the school during school hours must be cleared as a volunteer. It is a district-wide policy that each person coming to the school during school hours be cleared as a volunteer prior to being admitted. This includes coming to school to have lunch with a child, attending a field trip, or for a teacher conference. Parents, if it is necessary to change your student’s transportation during school, please fax (547-7985) a note prior to 2:15 pm (1:15 pm on Wednesdays) or you can send an email to [email protected] Last minute changes are discouraged as they often confuse the student. If your student is not in the building by 8:30 a.m. they are considered tardy and will need to be walked into the front office by a parent. Encourage your student to get out of or into the car as quickly as possible. Pull all the way forward so that as many cars as possible can be unloaded/loaded at one time. Cell Phone usage is never allowed in the student drop off and pick up lines! Students should not be exiting their car before 8:00 am. There is no supervision for students before that time. Only cars dropping off extended day and safety patrol students should pull in front of the school before 8:00 am. In the afternoon please keep the yellow sign, with your student’s name written in large, black marker, in the window until your student is in the car. 1. CLIP– Clip your Box Tops. 2. BAG– Collect them in a bag. 3. TAG– Label the bag with your family’s last name, student(s)’ first name(s)’, teacher(s)’ name(s), and send them in. Do you have used ink cartridges? Old cell phones or cracked iPad’s? 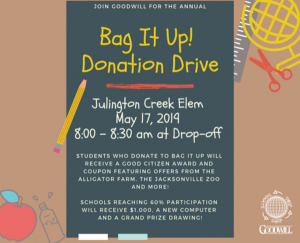 You can donate it all to Julington Creek’s Technology Department to earn money for our school. It is so easy… Just drop it off in JCE’s front office or have your child take the items to the Technology Lab. 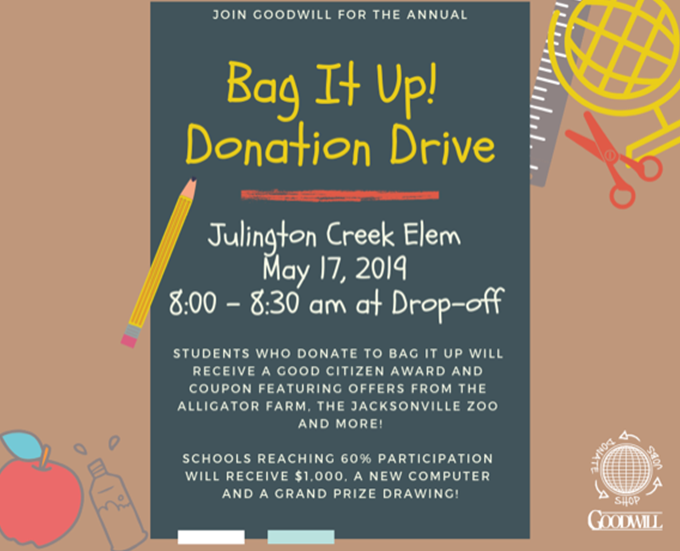 New to Julington Creek Elementary? Maria Chrissovergis, New Family Liaison, can help you with questions or concerns. Visit our Welcome page for more information and be sure to check out our informative newsletters just for newcomers. Thank you! Send a note or email to your student’s teacher and the front office letting them know your child will be leaving school before the end of the day. Come into the front office to sign out your child and show your identification. Early checkouts must be completed by 2:15 p.m. on Mondays, Tuesdays, Thursdays and Fridays. Early checkouts must be completed by 1:15 p.m. on Wednesdays. These policies are necessary to facilitate the safe dismissal of our students. • Shoes must be safe and appropriate and must have a back – no flip-flops, etc. • No tank tops, spaghetti straps, or shirts/dresses that are cut out at midriff. • Clothing must be free of logos or sayings with profanity, violence, drugs, alcohol, or tobacco or anything that would be disruptive to the learning environment. • Skirts and shorts must be no shorter than 4 inches above the knee. Leggings are permitted to be worn under a skirt or long sweater/skirt. • Hair should be a natural color and styled in a way that is not distracting. If you are a person with a disability who needs assistance to attend meetings or activities at Julington Creek Elementary, please call 547-7980 for help. Your child may be eligible for the McKay Scholarship Program for Students with Disabilities. For more information, please see the McKay Letter 2017-2018 and/or visit http://www.stjohns.k12.fl.us/ese/choice/.